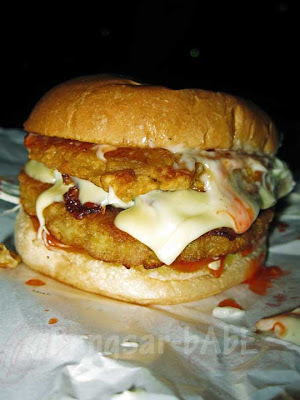 Continuing with my burger posts, I decided to try the Ramly Burger at SS2 Mamak Square. Apparently, you can also get good fried lala there. 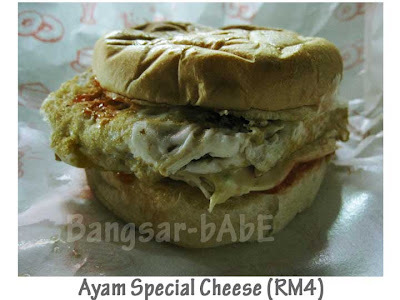 Unlike last week (OM Burger) where Jeen had a plain burger, I informed her 12 hours in advance so she took the Beef Special Cheese and rif, the Ayam Special Cheese. Wan, the burger chap was quite friendly and sportingly answered all my questions. 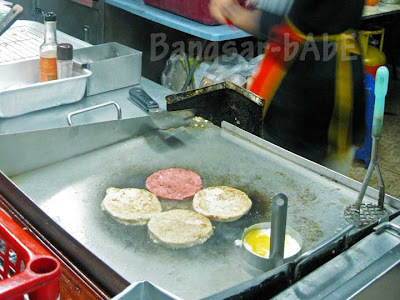 While he uses local chili sauce (Puteri) for the burgers, the mayo and cheese are imported. On a good day, he sells between 100-150 burgers. 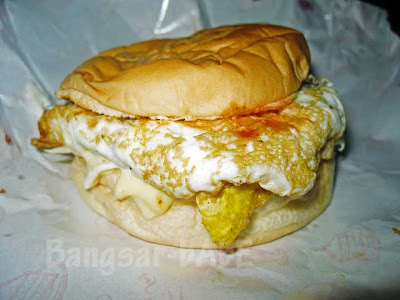 Bun base + mayo + chili sauce + chicken patty 1 + sunny side up + cheese slice + chicken patty 2 + chili sauce + shredded vegetables + bun top. Massive, I know. Again, it was hard to put the whole thing into my mouth. Tastewise, I thought it was better than average, but nothing spectacular. I would have preferred the egg to be wrapped around the patty, or at least one of them. The sunny side up was overdone making it rubbery. On top of that, the sauces used were not as liberal. rif and Jeen’s burger fared better because the egg is wrapped around the patty. I was disappointed because he added the cheese on below the egg-wrapped patty instead of putting it inside. This makes the burger less juicy, less sloppy and less fulfilling. 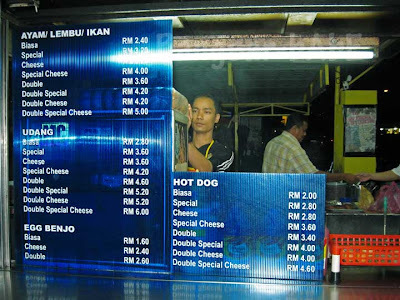 *For those who are greedier than myself, Wan also does a TRIPLE Cheese Special as per request. So knock yourselves out! Verdict: Satisfying, but something is still missing. the burger really look massive! price wise also very reasonable for such a big one!!! I would love to try these burgers you’ve been reporting on! It’s hard to make a burger unique anymore, but these, I have to say, are really impressive. I mean, I read this and salivate like Pavlov’s hungriest dog: “Bun base + mayo + chili sauce + chicken patty 1 + sunny side up + cheese slice + chicken patty 2 + chili sauce + shredded vegetables + bun top.” This is INSANE. I would love to get the calorie count on one of these babies…but not until AFTER I’ve eaten it. For health’s sake, I hope you’re getting lots of veggies on the side! wah …. this is getting more n more absurd, like American style of Size-Ups liao … LOL. BABE, lovely writeup in NST today about your blog! hey, how come u are UN-ADDABLE on facebook? i got to your name, but cannot add as friend one? Nuff’ said. 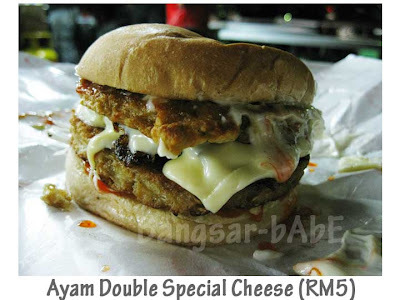 cheap and tasty, just ignore the general unhealthiness of Ramly burgers and I guess it’s okay. Any makan places around Taylor’s College? Sapuche – Insanely unhealthy! =P Don’t bother with the calorie count…just eat!! fatboybakes – Thanks! Eh, sorry…I changed my settings to private, forgot to change back. A lot of weird friends request back then. chuan yang – Forget healthy. Just dig in! would you steam fish if you ever had to cook for your friends? eh, i oso want to do food program. come, can do together gether ah? Congratulations ! You have flown in just at the right time ! CUMI & CIKI – Heya! Nice of you to pop by…and thanks! 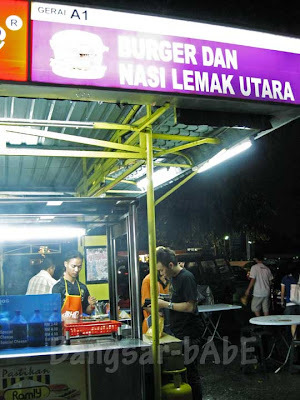 U should try the Burger Lori at Subang SS15, near the market. It opens from 8pm up to 3am on Sats to Fri..closed on Sundays. Very good. Hey, I blogged about this recently.